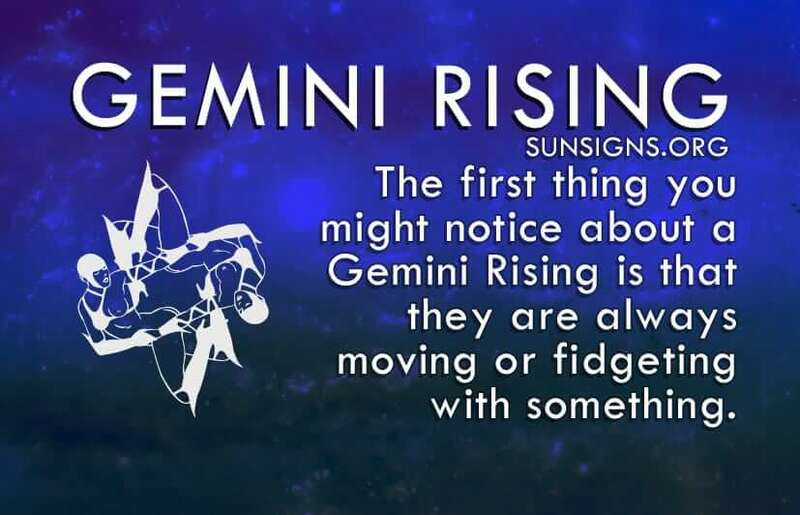 The first thing you might notice about a Gemini Rising is that they are always moving. Fidgeting with something between their fingers, shaking their foot, restlessly tapping their nails on the table. They are easily distracted, often on their phones while supposedly on a conversation with you. But do not be discouraged. It’s just their nature. The Gemini ascendant sign need constant stimulation. Actually, they are quite skilled at multi-tasking, able to carry on a conversation, plan their next week, and pack their suitcases, all with one hand. Ruled by Mercury, Gemini Rising sign in astrology are quite the conversationalist, social beings with knack for saying exactly what they mean and saying it well. Their language is very clear and direct. You won’t be confused about the point that a Gemini ascendant is making, because they simply say it, in the easy fashion imaginable. Their language is never crass, but rather characteristic of the wordsmiths that these star signs are. People with their ascendant in Gemini are stimulated by the mind, always curious, but hardly ever emotional, rather “coolly detached.” They are intellectuals and analyze much of what comes their way, often eager to explain many of their analysis to you, as well. For that they are often great teachers. Now for some, this can come across as egotistical, and in a way, it is. People with Gemini rising in their horoscope believe that they know better. And they love being the center of attention. This ascendant sign wants you to come to them for knowledge and not the other way around. Gemini Rising crave variety, due to their extremely short attention spans. This makes for a lively exchange of ideas and rarely a dull moment. Although they find it hard to focus, their interests and attention spans can easily be revived and brought back to topic with the right spark of information. It just has to be a new spin to the old topic. People with Gemini rising in their birth chart are of medium built physically. They are blessed with good health and do not suffer from any major ailments. They are usually slender and in fact need to put on weight. Their hair is usually dark brown in color and they have long artistic fingers. Now, don’t expect anything permanent in love from this one, as the Gemini Rising man or woman keeps things in a constant state of flux. They are never clingy in relationships. In fact shy away from anyone who makes too many emotional demands on them. Don’t be surprised to find a Gemini ascendant with multiple divorces and multiple marriages, multiple careers or homes. These guys simply just can’t stay put. Once the Gemini rising sign have lived one experience, they quickly become bored, ready for the next adventure. Being stuck in that experience makes them discontent. They have to have the new. The old will just not do. So this zodiac sign just get up and leave their partner in search for something better, something that will hold their attention better than the last. You may even feel as if you are dealing with two completely different people at different times of the day. And yes, you are. Gemini signifies the twins, a dual personality that is often the complete opposite of the other. Gemini ascendants usually have a somewhat bipolar disposition, seemingly happy and sad at the same time. In many ways, this makes Gemini rising quite disorganized, as he or she doesn’t stop to take the time to think through all the thoughts and plans and adventures running through his or her mind. It also gives them a snobbish air, because they can’t be bothered with your already old topic of five minutes ago. Gemini ascendants don’t mean to be rude, it’s just that their minds jump at speeds light years ahead of the other zodiac signs.